Love these purple chairs. Nice material. Will clean up nicely. Just what I wanted with this black table. Love the look. Tie your contemporary kitchen together with these comfy parsons chairs from Christopher Knight Home. The espresso-finished rubberwood frame features an upholstered seat with a button-tufted back for modern style. Choose from four fabric colors to complement your color scheme. 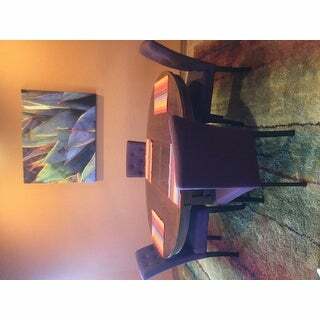 We purchased the Nyomi Fabric Dining Chairs for the dining room in our retirement home in Las Cruces. 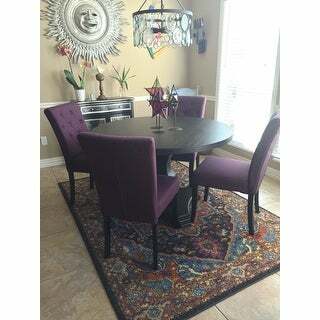 After deciding the deep purple would compliment our Boho Pueblo style, I placed the order for four chairs. The four chairs arrived in two, well packed boxes. After reading the instructions the four chairs went together quickly and easier. In fact, I was disappointed that it didn’t require more adult beverages to finish the project! 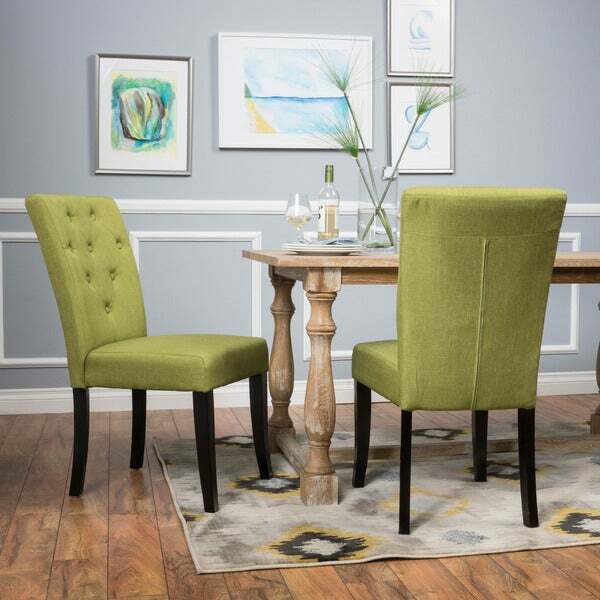 The chairs are sturdy, well built, and look great in our dining room. I believe the chairs were a very good value and will give great service for years to come. Addendum: We likes the chairs so much that I ordered two addional chairs to complete a seating of six for our dining room table. Ordered the grey and love them! The material is high quality and feels very durable. The tufting and diamond pattern adds a subtle but fashionable design. The back seams are perfect and give the chairs a contemporary but classic look. The seat cushions are thick, firm and comfortable. When you sit on them it gives a little but you do not “sink” into the cushion like a sofa. I paired the chairs with the Iconic greystone pedestal expansion table because of the scale. 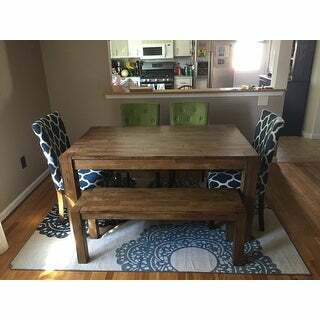 The table is 45 inches diameter and the chairs fit around and under the table very close to the table top. The chair back height is above the table top showing two rows of the tufting. The chair is rated for 250 pounds which was a concern, but have had heavier people try them and they were pleased with the chair width and sturdiness. Assembly: Follow the instructions. The chair back and back legs are all one piece, then you have the seat and 2 front legs to put together (4 pieces total). I did the assembly myself and the first chair took 30+ minutes. Each chair after was 10 - 15 minutes faster, you get into a rhythm! Be patient and do not over tighten the bolts as instructed until you sit on the chair for the wobble test! I used my table to install the front legs and place the fabric covering on the bottom of the chair when bolts were tightened. It would have been easier with 2 people as recommended but it is possible to do the assembly yourself. Very happy with the purchase and recommend to others! I ordered 6 chairs and 4 were fine but 2 had issues, but still usable. Love the style of these chairs and the quality is better than those I've at a more expensive price (the 4 that were perfect). The assembly was easy, took one person and about 10 minutes per chair. As for the 2 I had issues with...one had about a 2 inch gap between the seat and the back once assembled and one had very uneven legs. Still, overall, I love these chairs. The chairs were packed well for shipping and really quite easy to assemble. I suggest some power tools over the allen wrench provided but all in all an easy job to accomplish. The chairs are sturdy and look fantastic! The color is exactly what was advertised and they are comfortable to sit in. This was such a great deal for the price! I can easily fit eight chairs around a rectangle 120 inch table with room for people to maneuver in and out from the table. Seat height to table is perfect too. A booster seat will easily strap to the chair as well. When I received the chairs I had to put together the legs on the chairs but they were very east to place on. The fabric on the chairs were very nice looking and look and feel like high quality fabric. The buttons on the chairs add some extra flair as well. I would recommend these chairs for the price. These chairs are so beautiful! The quality is truly second to none! From now on I wont even blink, when I see it is a Christopher Knight product. The pictures of the material, does not even do it justice. My grandson spilled yogurt on it the first day and I didnt realize it until the next day and was freaking out. It came off so easy, just a wipe with a bit of dish soap. While it takes a bit to put together (it was entertaining for my daughter and I) I really wasnt expecting them to be such high quality, because of the cheap cost. Boy was I wrong. The frame is made with solid wood, there is a solid fill, with actual heavy metal, strung in. I really love the Velcro cover for under the seat. It allows to inspect anytime and yet looks beautiful. NO BETTER CHAIRS!!! I ordered the chairs in grey and the came as pictured. Nice fabric and upholstered very well. One chair came with a broken leg due to poor packaging but when I called, it was replaced within a week. Did have trouble getting them level and they all rocked when first assembled. By making adjustments where the seat attached to the chair back , we were able to get all 4 legs level. I purchased these chairs for my dining room table. The backs of the chairs are not as high as I wanted but close. They are comfortable and have held up well, as I purchased them 9 months ago. I love the green color, as it adds a subtle pop of color. I also like the fabric. Love the apple green color. I have a round wood table and I have 2 chairs in red and 2 Apple green. It made the whole dining set very modern becoz of the pop of color. The seats are firm which is how I like em. Package well and easy to assemble. Shipping was uber fast coz I got it a day early. Great buy for the price. I love these chairs! The fabric is high quality and they are relatively easy to put together. They give my dining room a sleek, modern look. 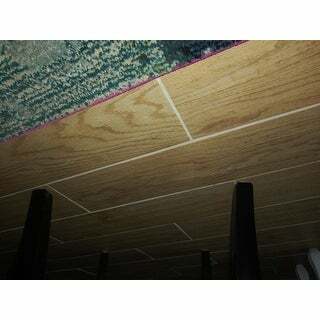 However, when the chairs arrived, there were pretty big scratches and dings on the legs. I will be sending a photo to the company to see what they can do about this. Otherwise, it's a great value for the price! Wonderful New Chairs for My Dining Room! I love these dining chairs. They go perfect with our dark wood kitchen table. They are just the right size. I bought 6 of the blue ones and I am very happy with my purchase! The blue is a good shade of blue. Almost a dull turquoise. Very pretty. the gray linen is a nice color but the legs are black and not "dark stained" as the description read. The black legs looked totally wrong with our table and I needed to return them. Overstock did not pay for the return shipping on these chairs. Not happy with Overstock and had been happy with them on past purchases. Will be doing business with Wayfair from now on. The legs are not even and the seat is not firm. You can feel the wiring I told him if we requested two new legs and instead they sent two chairs I expected there to be a return label included it was not. The chairs are waiting to be returned however they have now charged me for the replacement chairs I'm not happy with this I would not buy these chairs again. Love the color of these chairs. The green is what is in the picture. Goes with the dining room set I designed perfectly. They are very comfortable to sit in. Only downfall is after trying multiple attempts to get the legs even, there is still a wobble. Even tried dropping the chair as the instructions state. Very easy to put together. They look ok - I stuck them in a corner. They wobble a bit and the craftsmanship is wanting. I kept them only because it was too difficult to figure out how to return them - and we had already put in hours to getting them to quit wobbling. These are actually fabulous chairs for the money. I am only giving them 4/5 stars mostly because one came with damaged legs (which I am sure Overstock will fix - they have great customer service) and because the teal blue color is not as pictured. It is more of a subtle blue-gray, which worked great for me but might not be what one expects after seeing the photos. These look great in my dining room with a dark wood table. We got 2 of the blue as accounts for the ends with 6 gray chairs for the sides. The chairs are beautiful and look great with my table. I’d like to give it 5 stars, but the chair legs aren’t even and 3 out of my 4 are wobbly, with one leg so uneven I can fit my hand between the end of the leg and the floor. We swapped the legs and tried to reattach thinking we did something wrong, but after the third try we just accepted they are uneven. Other than that issue, they are great chairs. When I received the 6 chairs I had to put together the legs on the chairs but they were very easy to place on Love the style of these chairs and the quality is good took one person and about 10 minutes per chair. .I love these chairs. I purchased 6 gray chairs for my dining room and they are perfect ! They look well made and are so comfortable ! I love these chairs so much I added 2 more to my dining table. very nice chairs, comfortable and sturdy. I would buy again. Chairs are comfortable easy to move. I would recommend them to a friend. "when will the green color be available?" We expect this back in the middle of May. "How is the chair seat constructed? Is it a woven nylon with seat cushion on top of that? Or a press board/wood shape with the cushion on top of that?" "Is there a zipper down the back of these chairs, or is it just a top stitched seam? Looks kind of odd." Yes, there is a zipper on the back of this chair. I didn’t have a zipper on my chairs. "What is material of legs? 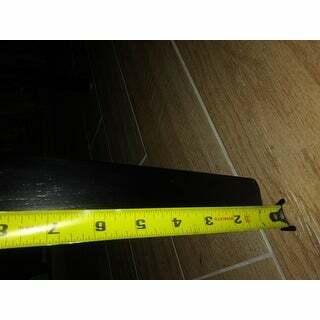 And can legs be cut down as seat height is too high 4 short person.I am 5’2"
"The leg material is made of Rubberwood, and I would not suggest you cut the legs it will void your warranty and ruin the integrity of the item. " "What color are the legs for the blue chair?" "Are the legs on the teal chairs dark brown or black?"